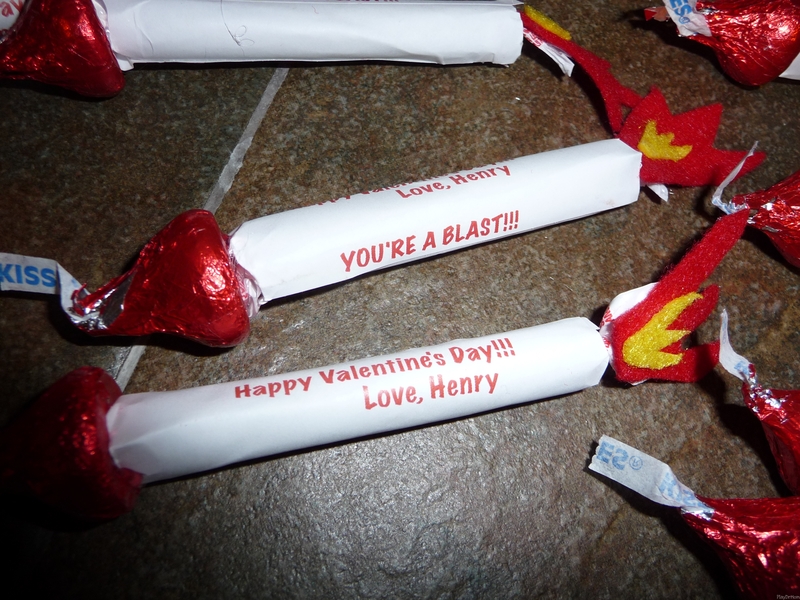 I made this for Henry to give away last year at his preschool’s Valentine party. I found a bunch of great Valentine ideas on the Family Fun website and Henry picked this one as his favorite. The instructions said to use a roll of Lifesavers … but I couldn’t find any when I was trying to do the project. Instead we used long Tootsie Rolls … which were really too small in circumference … but worked ok. I printed out address labels with the message and just stuck them around the Tootsie Roll (sure beats handwriting them all!). On the top I used a glue gun to attach a red Hershey’s kiss. The “flame” was the most labor intensive part; I cut small red and yellow flames out of felt and used regular Elmer’s glue to adhere the pieces. 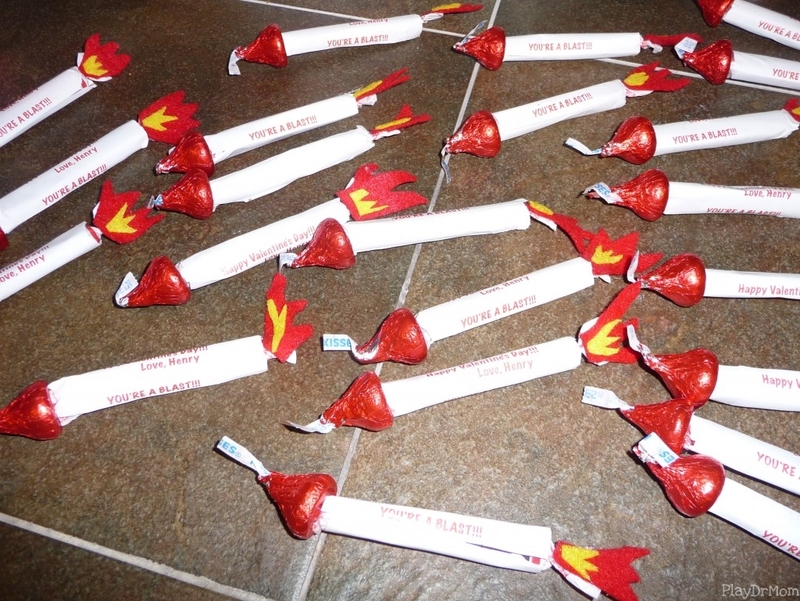 I used the hot glue gun again to attach the “flame” on the “rocket”. Want more AMAZING Valentine ideas? Link up to the collaborative project from Mama Pea Pod of an amazing group of kids’ bloggers, the Valentine Ideas blog hop! Mama Pea Pod, Let Kids Create, My Creative Family, Hands on: as we grow, La Dolce Vita: The Sweet Life, AngeliqueFelix.com, The Golden Gleam, Teach Preschool, Critters and Crayons, Living at the Whitehead Zoo, The Iowa Farmer’s Wife, Nurturestore, Kitchen Counter Chronicles, The Chocolate Muffin Tree, Jamie’s Jumble, The Outlaw Mom Blog, Mama Smiles, The Mommies Made Me Do It, Dinosaurs and Octopuses, Mom to 2 Posh Lil Divas, Toddler Approved, Messy Kids, Rainy Day Mum, JDaniel4sMom, Glittering Muffins, Red Ted Art, Mommy and Me Book Club, Putti Prapancha, Dilly-Dali Art, Creative Connections for Kids, Mommy Labs, De tout et de rien: Activités pour le Préscolaire, Imagination Soup.net, Rockabye Butterfly, Classified: Mom, Kids Creative Chaos, A Mom with A Lesson Plan, PlayDrMom, RainbowsWithinReach, Living Montessori Now, Curly Birds, Growing A Jeweled Rose, The Home Teacher, A Little Learning For Two, Sun Hats and Wellie Boots, The Imagination Tree, Mummy Mummy Mum, Critters and Crayons, La-La’s Home Daycare, Come Together Kids, Tinkerlab. I can see why those were his favorite! Those are absolutely adorable!. I’ve pinned this and I’m sure we’ll be doing these eventually. My little boy loves outer space. 🙂 Thanks for sharing. I think the tootsie rolls worked just fine! such a fun idea, love how they turned-out!